You are here: Home / Travel / Out and about / Natural Childhood / Helicopter parenting…not! But what about risks and stranger danger? Over the past week I have had to seriously resist being a helicopter parent and hush that little overprotective parent’s voice in my head. The other day the kids got home from school with friends and decided to go out and play on the trampoline. They didn’t actually make it to the trampoline, but got distracted by ice in the different pots and water butts. They decided to have an ice fairy party… don’t ask! Everything nowadays seems to be about fairies and princesses. There was a spectacular three-tier cake, decorated with herbs and other dishes. The salad was water and rosemary. I really had to resist the urge to interfere as I watched them pouring water from the watering can in the freezing cold. Instead I stoked the fire and got some hot water bottles ready for when they came in. The only time I did intervene was when I saw them munching on some greenery… I went out and checked what it was. Just some chives, so I let them carry on. When they got cold they each came in one-by-one and sat in front of the fire, warming through before starting to play inside. On Friday I kept on putting off going for a walk with Andy and Max in the hope that my dad would go out with them. He really needs to get into the habit of going for a walk! Finally, Max fell asleep in the pushchair. And we set off with Andy… just as it started to rain. Oh well!- I thought- we’ll just need to warm up when we get home. The pushchair had a rain cover over it, Andy had a thick coat and I had a warm fleece (one which stays warm even when wet). We set of to the playground at the end of the road. Andy cycled ahead as he usually does. Going 2-3 lamp posts ahead, racing on his balance bike and I followed with Max sound asleep in his Xplory. We got to the playground, which is really a park with some play equipment and some hills. Andy wanted to practice his downhill cycling that he’d practiced with Granddad at the bringing of the week. I didn’t quite realise what this entailed until I saw his hurdling down the bit of tarmaced incline. He wobbled a bit and my heart stopped momentarily: He had no helmet on, just the hood of his jacket. I had visions of him falling and banging his head. He was a little daredevil and loving the speed he gained, balancing very well. I resisted cautioning him to take care, because that’s when you plant a doubt in the sub-conscience and they do fall. So I put my fears to the side and encouraged him, making suggestions on how he might do it to “go faster” ( safer). On the way home we went a slightly different way, coming out beside the church onto our road. Here Andy raced ahead on the graved path and I expected him to wait, as usual, on the street. Instead, he was far ahead almost home. Beyond shouting distance (especially with the wind). There was a man standing beside him, looking back towards me. I assume he saw a young child and stopped to make sure he was OK. I waved as I saw them, and indicated for Andy to come back. He didn’t! Instead both him and the man started heading toward the end of the street. Then the man started running… probably racing Andy, and him after. This is when I started to run, but they were too far ahead so I was panicking. I reached for my mobile to call Dadonthebrink to quickly come to the front door and intersect them, but as I was talking to him Andy turned back and headed back to me, the man turned the corner. I was shaking! I tried not to show how frightened I had been, but told him off, saying he’s not to EVER go that far again and it wasn’t OK to talk to strangers, because some people are not good people and they hurt children. I’m really upset by this turn of events. We were having so much fun, but there is so much danger- real and perceived- lurking. I would never forgive myself if something happened. On the other hand I’m not a helicopter parent and don’t want to become one, I do like letting the kids explore a bit. But how do I balance my fears for them with providing some of the freedom that I had as child? How do you approach this part of parenting? Am I bad parent for him even being at the other end of the street with a stranger? It’s a tough one isn’t it. I once was quite happily walking home from Playschool with Isaac and even though every other time he stopped to cross the road, this time he didn’t – I was so relieved no cars were coming! We have rules in place now that they have to be within sight and not run off and I am really lucky that we don’t have any long expanses of road locally. If we are at the park / forest we normally have a tree marker but at the beach we keep them much closer as its normally very busy – especially in the summer. I really don’t know the answer to this one. my son is three and a half and he has developed a habit of coming out of our gate and running off to hide instead of getting in the car. it’s right next to the road and every time he does it my heart leaps into my mouth. I would have been scared by the scenario you described as well. even though the chance of a stranger being a bad one is incredibly small it’s still always a thought that’s there. I sympathise but have no useful advice as its something I struggle with too. 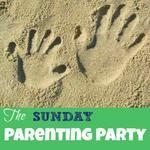 I’m sharing your post on the Sunday Parenting Party Pinterest board, thanks for linking up. I struggle hugely with this. I am more than happy for him to try new things, to do potentially dangerous things like playing on the BMX track etc but if he is at a distance away from me where I don’t feel I could get to him before someone else could I get panicky. Even at soft play I need to be able to see them. It is so so hard to not put that onto them. Wow – what a day! I think you did really well encouraging them to go outside and not jumping in with your kids – they definitely need their own space to develop but it is so very hard. I think you did everything right, but there will always be incidents that we percieve as near misses even if they’re not.